William Thomas "Willie" Smith and Harriet Octavia "Octney" or "Tavey" Brownlow. This photo was made late in their lives, probably in the 1920s. She died in 1935 at the age of 78. In 1900, in the Kingston District of Bartow County, Georgia, an improbable near convergence occurred for the Smith and Hall families. Thiddo Smith’s grandparents William Thomas “Willie” and Harriet Octavia “Octney” Brownlow Smith are living only 14 houses from Shem Carnes, Gladys Hall’s gg-grandfather (Gladys was Thiddo’s wife). They are living north of Kingston, near what is today called Hall Station (no relation). Today there is a Smith Loop off the Hall Station Road just south of its intersection with Snow Springs Road, but I do not know if this is where they lived. The loop looks like a segment of the old road from Kingston to Adairsville. (Who the heck are Thiddo Smith and Gladys Hall? See the Smith-Hall nexus). 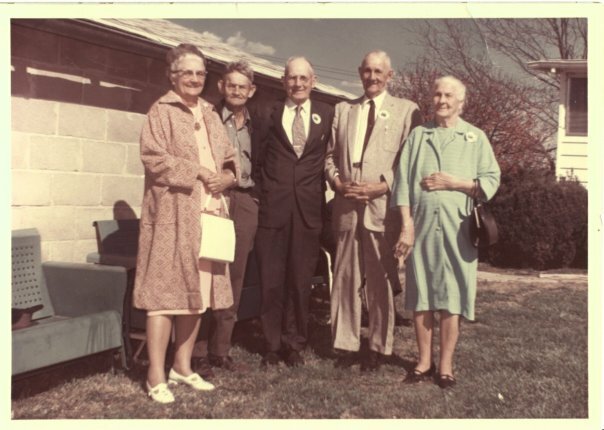 While the two families would connect 47 years later with the marriage of Gladys and Thiddo, it is interesting to speculate if they knew each other then. William Thomas Smith and Harriet Octavia Brownlow themselves were the product of a convergence of their families. Harriet’s parents, James Alexander Henley Brownlow and Jane Ann Austin Brownlow, moved to Hall Station, sometimes also called Linwood, about 1870, while William’s parents Albert Smith and Ursula Collins had moved to the Kingston area by 1880. Linwood was a very small community a few hundred yards northwest of Hall Station that apparently no longer exists. When the census was taken 19 June 1900, James A. H. had only been dead 11 days, and Jane was living two houses from William and Harriet Smith, with her brother John and his wife Sallie, William’s sister, in between. The families may also have been in the vicinity of Connesena Baptist Church, which is a short distance off the Hall Station Road, since both James A. H. and Jane Ann Brownlow are buried there. J. A. H. Brownlow, a resident of Polk County, was a member of Company K, Georgia Regiment, Johnson’s Cavalry. He was captured by Union forces, and released in Kingston in May 1865. Perhaps he liked the place. For more on his Civil War service, see “Our family in wartime”. A further convergence occurred shortly after 1910, when the family of Newton Berry Davis and Mary Elizabeth “Lizzie” Marsh moved from Wayne County, Kentucky, to the Kingston District. Why they moved is a mystery, but Elizabeth’s father, William Harrison Marsh, passed through Kingston as a member of Company A, 9th Kentucky Infantry, a unit of Sherman’s Army (see "Our family in wartime"). Perhaps he liked the area, too. William and Harriet’s son James Henry Smith met and married Newton Berry and Mary Elizabeth’s daughter, Rosa Alice Davis, there. They were Thiddo Smith’s parents, but there is more on Jim and Rosie here and here. William Thomas Smith was born 13 September 1867 in Bartow County, and died on 4 February 1949 in Bartow County at the age of 82. His wife Harriet Octavia Brownlow was born 13 April 1860 in Van Wert, Polk County, Georgia, and died 20 April 1935 in Bartow County at the age of 78. They were married in Cherokee County on September 19, 1886. They are buried at the Pisgah United Methodist Church Cemetery in Kingston, and their graves were recently marked with a headstone. In one census record, she is listed as "Octney," but according to Jason Edwards, who has done extensive research on the Brownlow family, she was known as "Tavey." 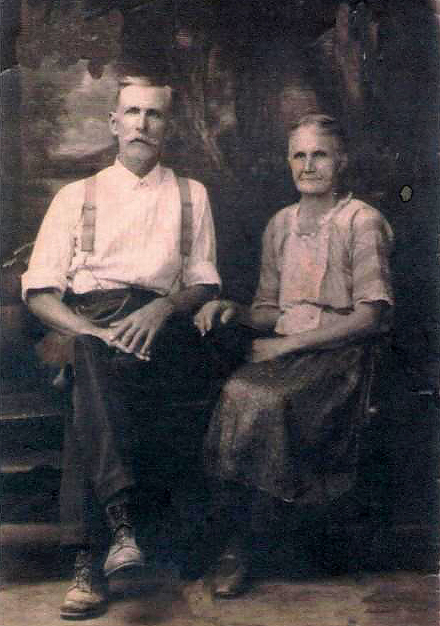 William and Octavia are first recorded in the census records in 1900 living in the Kingston, Georgia District, but according to Jason Edwards many of the Smiths and Brownlows moved briefly to Alabama in the 1890s. He believes it was around Piedmont. He said that "They only stayed there a short while and decided that they liked it better in Georgia. Naomi Cowart Jones, granddaughter of Uncle Jack (Henry Jackson Brownlow) told me that the night before they left they made up a song that went something like 'We’re goin’ back to Georgia in the mornin'." She was born many years later but her mother, Rhoda Alberta Brownlow Cowart, was among the ones that made up the song and could remember the words, though no one ever wrote them down." By 1910, William and Octavia had moved to the adjoining Cassville District in 1910, but an exhaustive search of the census records for Floyd and Bartow Counties in 1920 failed to produce any evidence of them. In 1910, William is a farmer working rented land, but by 1930, their prospects had improved considerably. They are living in a $1000 home in Ward 6, Rome, Floyd County (the Calhoun Road area), and William is a carpentry contractor. Their house was off Old Calhoun Road on Stansbury Street in Northeast Rome. Several of their children also lived in this area. Octavia is remembered by her granddaughter still living as having reddish hair and being very sweet. According to Jason Edwards' "Aunt Mattie," she "was kinda short and fat like me." When they lived on Stansbury Street, they had grapes growing along a fence in front. When the granddaughter visited and grapes were in season, she would ask Octavia if she could have some grapes, and Octavia would reply, "Yeah. I'll pick you some." Aunt Mattie, who was raised by "Mama" Brownlow and her husband James Madison Brownlow, via Jason Edwards, told a story about a time "when her family went up to Kingston to help the Smith’s pick cotton. She was sent to the house to get a pitcher for water and Aunt Tavey was making biscuits. Aunt Tavey had stepped out of the kitchen and a big rooster had come in and got stuck in the dough in the bread tray. When he would pick up on foot he would crow and then put the other foot down and crow. Aunt Mattie grabbed the pitcher and ran out of the kitchen so she never knew what happened when Aunt Tavey came back but she said that when they passed the biscuits around she couldn’t take one, though she was hungry, because all see could see was that big rooster in the bread tray!" Octavia also made mittens for her grandchildren during the height of the Great Depression but had not finished all of them when she died in 1935. Jason Edwards also related another tale that Aunt Mattie told about “Uncle Willie.” At the funeral of "Daddy Bud" (James Madison Brownlow), " they were all sitting in the front parlor at the Brownlow house in Aragon. Uncle Willie told Aunt Tavey 'Well, Jack, Sis, Emma, and Bud are all dead and Wimp will live forever so I guess you’ll be next.' " While he may have been joking around, "Aunt Mattie thought that was an awful thing to say at a funeral." Sometime after Octavia died, William moved in with his daughter Julia at her home off Calhoun Avenue in Rome. He lived upstairs in the house and would only come downstairs for meals and church. He consumed nothing that contained caffeine, and he was a very religious man. He belonged to the North Rome Church of God. At meals, William prayed twice, once on the floor and then over the food. William Thomas Smith is the "Uncle Willie" I once heard about from a Brownlow relative. According to this source, as well as Jason Edwards, Uncle Willie, when he was young, was a terrible man who beat his wife and children. Jason Edwards said that his sister-in-law, Sarah Elizabeth Philips Brownlow, did not care for him too much, but after he reformed and became a preacher, every time the Smiths visited, she would have him say grace. He was very long-winded, though, and Jason's "Aunt Mattie" dreaded it: "She said he would go on and on and she’d have one eye open staring at the chicken." The story of Uncle Willie's radical transformation is legend in the family. One day he fell into a coma, probably from a stroke. The family put him on his bed and he remained there for seven days, not moving, speaking, or showing any signs of awareness. After seven days, he woke up, and said that while he was paralyzed, Jesus appeared before him. "Now move your little finger," Christ said. Willie could not, of course, and from that time on was a changed man. He became very devout and testified about his experience in area churches on Sunday. He never laid a hand on his wife or children again. When he died, it was said, "If anyone gets into heaven, Uncle Willie will." But, when his daughter-in-law Rosie tried to tell him that his son and her husband Jim "had the devil in him," Willie refused to believe it. Jim was a pathologically violent man who severely beat his children and is known to have hit his wife, once causing her to abort a pregnancy. Since violence acts like a genetic disease (some of Jim's brothers and his sons were known for their violence against family members), Jim was probably beaten as a child, and Willie could have been denying his past out of guilt. A possible source of what came to be called the "Smith temper" could be the Civil War. Willie's father, Albert, who is also known to have had a violent temper, fought in the 18th Georgia Infantry as part of Hood's Brigade. General Robert E. Lee used the brigade as his "shock troops," and in the Battle of Cold Harbor, Hood's Brigade, led by the 18th Georgia, broke a stalemate in the battle by charging the Union lines. In all, the 18th Georgia had 146 casualties in that battle. Albert was severely wounded soon after, at Manassas, and had to have his left leg amputated below the knee. In addition, his family farm lay in Sherman's path when he marched through Georgia in 1864. If Albert had PTSD from his service, which is very possible, it is possible that it caused or increased his aggression and violence toward members of his family, one of the disorder's characteristics. For more on Albert and his first wife Ursula Collins, see "Love Amid the Ruins." 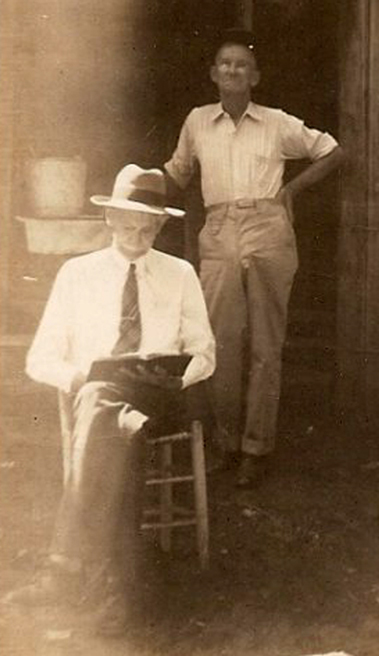 William Thomas "Willie" Smith reading his Bible in the 1940s. The man in the background appears to be his son Oscar. 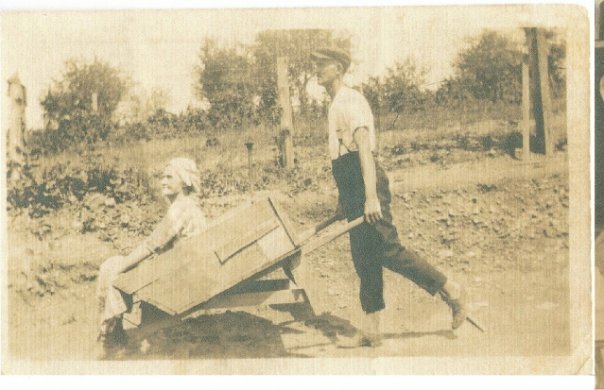 Harriet Octavia Brownlow Smith, being pushed in a homemade wheelbarrow by her son, Albert Canada Smith. It is notable that three of Willie and Tavey's children married Hogan siblings, and two married Davis siblings. It is also notable that many of them lived on the Old Calhoun Road, or Calhoun Avenue, near its junction with North Broad Street in Rome, Georgia. 1. Sallie Anne Smith or “Anna," born August 1887, in Bartow County, Georgia. I don’t know when she died. She married James Horace Hogan. In the Bartow County marriage records, an Anna Smith married Joseph C. Hogan on 19 February 1905, but he is listed as James in the census records. Her brother, Albert Canada, below, may have married James’ sister Sallie Hogan (see below), and her sister, Julia, married John Grady Hogan. In 1920, Horace is a blacksmith renting a shop on Broad Street in Rome, Georgia. The shop was near the end of the street in the census records, so it may have been in the vicinity of Calhoun Road. Among James and Anna’s neighbors are people who work for a pants factory, a cooperage mill, a stove foundry, a chair factory, a lumberyard, and a meat market. Horace later became a Baptist minister. Ruby Hogan, born August 1912. Teasley Hogan, born 1915. He was a preacher, also. Julia Hogan. She married a Franklin. He was a preacher too. He died fairly recently. 2. James Henry "Jim" Smith, born 3 February 1888 and died 15 December 1971 at the age of 83. James Henry is Thiddo's father. See more about Jim in the page devoted to him and Rosa Alice Davis in the Smith-Hall nexus. 3. Albert Canada “Uncle Cann” Smith was born 25 May 1890, probably in Kingston, and died in August 1982 in Rome, Georgia at the age of 92. He married either Sallie Weaver, or Sallie K. Hogan about 1914 (the accounts are in conflict), but I could find no official record of their marriage. Cann and Sallie are living in the Watters District (Shannon) of Floyd County in 1920 with his brother George in the household. He is renting a farm, and he and his brother are both farmers. Sallie “was a good woman” her niece, still living, said. In 1930, Albert and Sallie are living at house number 313 in Atco Village, Cartersville, and Albert is a “creeler” in the Atco (American Textile Company) cotton cloth plant. They are paying $3 a month rent on their home. They don’t have a radio. The Atco plant was established in 1903 by Edward Lee McClain to manufacture cotton "drill" cloth for his horse collar business, and went through several transitions, including being sold to Goodyear, before it closed in 2003. The company built the village, which today is a historic district, maintained the houses, cut the lawns, and in the days before indoor plumbing, supplied the toilet paper! A company worker would go around to all the outhouses each day and put a new roll of toilet paper inside if needed. The word “creeler” is applied to several jobs, but in this case it probably refers to a person who threaded yard into wooden bobbins known as creels or quills, used for the the weft of the weaving process. Weft refers to the cross threads, while warp refers to the large beams of cotton thread that formed the linear threads of the cloth. Other occupations in a cotton mill included overlookers, reelers (same as creeler), piecers, weavers, knotters, and ... hookers. Cann was known for his sense of humor, as was his son Willard below. At one time Cann would call his niece, Jim's daughter still living, and say, "Put on some biscuits. I'll be by directly and bring you some sausage. I want some biscuits and gravy." His niece said, "He would eat like a pig." Alma E. Smith, born August 1916. She married Albert Johnson and lived in the Coosa area of Floyd County, Georgia. She died of a heart attack. They had one child, a daughter. George Thomas Smith, born in July or August 1919. He was called “G. T.” He was a fireman in Florida. He married a woman named Louise, and they had one child, then married a woman named Velma. He died of a heart attack from a blood clot. Maud Cathleen “Cat” Smith, born 1923. She never married and I do not know when she died. Willard Smith, born 1825. His was called Willie and he lived in Alabama. As noted above, he is said to have shared his father's sense of humor. Mavis J. “Punk” Smith, born December 1927. She married twice, once to a Ship, had three children, and later to a man named Al. 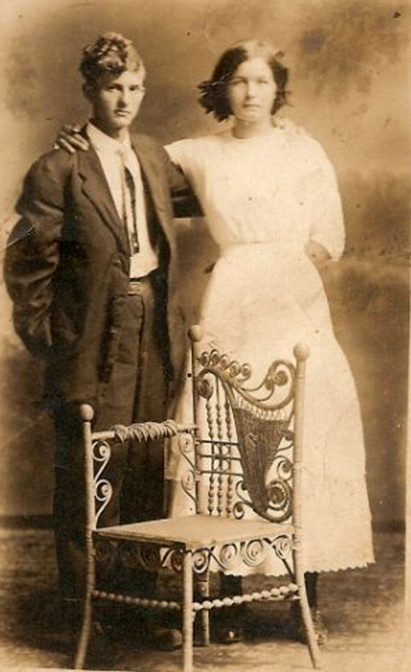 Cora Lee Smith and James Harley Davis on their wedding day in 1913. 4. Cora Lee Smith was born January 1892 in Bartow County, Georgia (probably near Hall Station/Linwood) and died in 1963 in Rome, Georgia. She is with the family in 1900 and 1910 according to census records. She married James Harley “Jim” Davis (her sister-in-law Rosa Alice Davis’s younger brother) on 11 May 1913 in Bartow County. 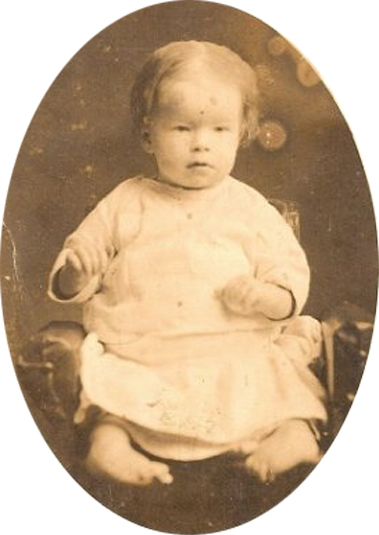 Jim was born 1 January 1892 in Wayne County, Kentucky, but his death date and place are mysteries. According to her niece still living, Cora once had a suitor who had the reputation of what we could today call a “player.” When her father found out, he confronted the man and told him in no uncertain terms to go away and never come back, which he promptly did. “Great grandpa Smith was one to be reckoned with,” a descendant said. In 1920 Jim and Cora Lee live in the Mt. Alto District of Floyd County (Georgia Militia District 1120). By 1930, however, Cora Lee is a widowed mother of three farming rented land on Veal’s Ferry Road near Coosa in the Livingston District of Floyd County (GMD 1059), due west of Rome. In late 1918, according to their niece still living, Jim left Cora, although he apparently returned in time for the 1920 census. Family accounts vary, but he supposedly left her and possibly went to Kentucky to work on the railroad, and by one account returned briefly, then disappeared again. Their niece still living said that Cora told her she was working out in the field when their youngest son Luther was nine-months-old (October-November 1918). Jim was at the house watching the baby and when Cora came home for lunch, she found that Jim had put the iron bedpost down on the skirt of Luther’s baby dress, to keep him from crawling away, and was nowhere to be found. Cora is said to have contacted a railroad company in Kentucky in an attempt to find out where he was, but they knew nothing of anyone by that name. “I remember Aunt Cora telling the tale,” her niece said. “She said, ‘I’m raising my three kids. She would go up on the mountain down at Coosa and split pine up for kindling and sell it by bundles to get the kids something to eat’.” Cora also fished the nearby Coosa River to help feed her children. When her nephew Thiddo Smith was beaten bloody with a plow strap or trace chain in the fall of 1940, and kicked out of his house by his father, James "Jim" Henry Smith, Cora’s brother, he went to live with Cora for a time. But Cora eventually told him, “Thiddo, you’re going to have to have somewhere to go. I can’t feed my own kids. That was when he went to get mama to sign the papers,” her niece said. Her niece may have meant kid rather than kids, since all of Cora’s children were in their 20s by 1940, but it is possible Nellie was still at home. In any case, Thiddo went to his mother, Rosa Alice Davis, Jim Davis’s brother, and she signed for him to join the army in March 1941 (he was only 16 but lied on his enlistment papers). Thiddo's sister, still living, said it made his father mad, but "he could do nothing about it." Her granddaughter also remembers Cora working at a laundry in Rome and lining her shoes with cardboard when they wore out. Veal’s Ferry Road was an early name for Georgia 100. Cora lived near the junction of Veal’s Ferry Road with Morton’s Bend Road, which still exists. It is a big loop that connects with Georgia 100 on both ends. Just to the north of its northern junction with Georgia 100, Georgia 100 crosses the Coosa River and joins Georgia 20 at the village of Coosa. Until a few years ago, the house was still standing, but it is said to have fallen into ruin. Above is a photo of Nellie Davis, born pigeon toed in 1915. At right is a photo of Nellie with her brothers Lonzo, at back, and Luther. According to family history, her feet were straightened through prayer. Nellie S. or Odell Davis (S. according to the census, Odell according to her granddaughter), born 25 April 1915 according to one source, 1914 according to her tombstone, and died in 1964. She married Roy Mize. She was born pigeon toed and was an epileptic. According to her granddaughter still living, Cora did not have the money for medical treatment, so she went to the elders of the North Rome Church of God. They prayed together and Nellie’s feet turned outward. The transformation is confirmed by family photos, although most children born pigeon toed naturally outgrow it. Also, when Nellie did not reach puberty at a normal age, Cora prayed for her and her granddaughter says that Nellie had her first period. The volume of blood was such she bled through the mattress she was lying on. It may have been a feather bed. At some point, Nellie moved in with Cora on Calhoun Avenue in Rome, a short distance from its intersection with Highway 53, and stayed there until she died. Cora lived just across the old railroad bridge behind Troy’s Barbecue, in the second or third house on the right. Cora’s death hit Nellie very hard. Cora’s niece said, “All she done was just grieved,” and I remember as a boy hearing that she grieved herself to death. General Alonzo Davis (Lauanzs or Luanzo in one census record), born November 1816. I don't know when or where he died. “Lonzo” as he was called, and his brother Luther used to spend a lot of time with the “Smith boys,” Jim Smith and Rosa Davis’s older sons, probably Robert, Evan, J. D. and Henry. Luther Davis, born January 1818. He married Mary Geneva Martin and they had four children, Jean, Ricky, Larry, and Michael. Mary Geneva Martin died in 1977 or 1978. He later married another woman named Mary, who, according to two descendants, was Luther's cousin on his father's side. One source says she was a second cousin, which would make her a child of one of William Thomas Smith's four brothers. “My brothers used to laugh at him when he was going with girls,” Cora Lee’s niece said of Luther. “He said, ‘I’m going to get me one the sun never shined on.’ [After he met Mary Geneva] They said, ‘He done did just what he said. He got one the sun never shined on'.” Mary Geneva Martin was about 14 when they wed. In her old age, Cora had long, beautiful gray hair and, according to a family member still living, "was as sweet as an angel." As a child, we visited Luther Davis and his family at their home on old Highway 5 just north of Marietta. Luther’s son, Larry, first introduced me to cigarettes, Kool Menthols. Double Yuk. He stole them from his mother. Larry, who was born in the 1940s, died Christmas Day 2004 of cancer in a hospice in Daytona, Florida. He had been homeless for several years. 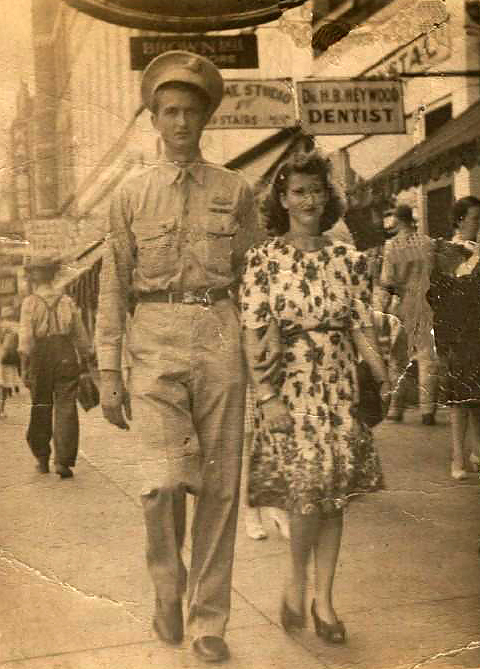 Luther Madison Davis and his wife Mary Geneva Martin, probably during World War II. A sign in the background says Kaiser, and appears to be a theater, but I could find no reference to a Kaiser Theatre in Rome, Georgia. Behind and to the right of them is what looks like the word "Krystal." There was a Krystal on Broad Street in Rome for many years, but I do not know when it was established. Mary Geneva was 14 when they married. 5. Willie T. Smith, probably William Thomas Jr., born 1893. He is not with the family in 1900 and must have died. His niece still living had no recollection of him. 6. George Malcolm Smith was born 30 March 1896 in Alabama and died in 26 March 1987 in Rome at about the age of 89. He married Mary Lois Temples of Alabama, born 5 October 1909 and died 19 December 1956, according to one family record, but the obit of one of his sons list his wife as Mary Perkins. She is buried in either the East View Cemetery or the adjacent Oakland Cemetery in Rome. George is living with the family in 1900 and 1910, and he and Mary are living with Cann and his family in Watters in 1920, where he is helping Cann farm. George is living with Oscar on Calhoun Avenue in Rome in 1930. George is a packer in a furniture factory, probably Fox Manufacturing. George had only two fingers on one hand, apparently from an accident. George and Mary had two children, Raymond Roger and Carlton, both deceased. Raymond Roger Smith was born 26 October 1929 and died 25 November 2009 in Rome. He was a former chief of the Rome-Floyd Fire Department. He joined the department in 1953, was promoted to captain in June 1964, and served as chief from 3 February 1975 until his retirement on 30 September 1988. He was a member of the Western Promenaders, a square dancing group, and a member of the North Rome Church of God. At the present time I have no other information on Carlton. Mary also had a child by another man, a girl still living, and at some point she left George. In his old age he lived with his sister Julia on Calhoun Avenue in North Rome. While there, George was known for always having something for sale sitting the front yard. A source told me that one of the brothers, she thought it was George, had killed a man, according to Thiddo Smith. Her description fit, but it is not known if Thiddo was serious or just trying to scare her. 7. Oscar E. Smith, born 1896 in Alabama. I met him once, but I don’t remember anything about it. He lived on Calhoun Avenue in Rome. I don't know when he died. He was known as “Uncle Oscar.” He is with the family in 1900 and 1910. His wife’s name is Bessie L., surname unknown, possibly Tillery, born 1905. In 1930, he is living on Calhoun Avenue in Rome with his brother George and his wife Mary. Oscar is a sander in a furniture factory, probably Fox Manufacturing on Calhoun Avenue. Whether they rent or own is unknown. Oscar and Bessie can read and write. They don’t have a radio. Oscar and Bessie’s are known to have had six children, some or all of whom could still be alive except William “Billy” Smith, who died of cancer in 2003. According to a family member, Billy was an alcoholic. 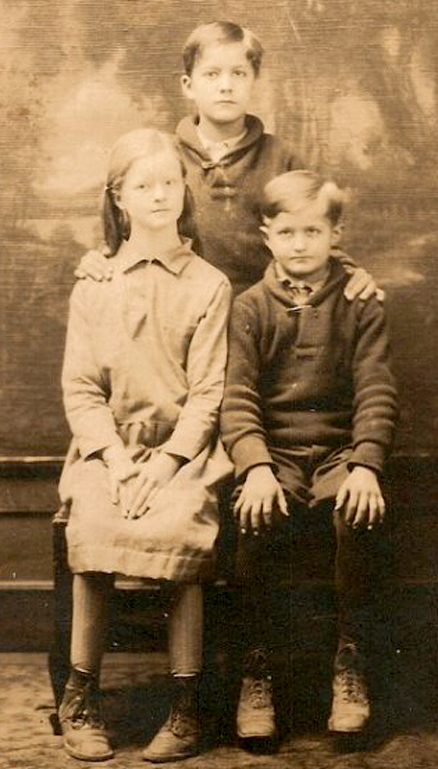 In 1920 there is an Oscar Smith, 27, born in Georgia, married to Bessie, 23, with a son, Oscar, 1, working as a bookkeeper at the Marble Works in Nelson, Pickens County. This could be our Oscar, but there are significant variances. Oscar was 22 in 1920 according to the 1930 census, and born in Alabama, not Georgia. And our Bessie was 15 or so in 1920. Also, our Oscar and Bessie listed in the 1930 census don’t have a son named Oscar, although the child may have died. According to a family source, Oscar was “a boozer.” He worked at a service station for several years, and for Fox Manufacturing for many years, and died at Redmond Park Hospital in Rome. 8. Julia Smith, born 29 June 1902, probably in Kingston, Georgia, and died October 1980 at about 78 years of age in Rome. She married John Hogan, born 1899, and later married a Mitchell. She had or has a daughter who lives in Carroll County, Georgia. She is with the family in 1900 and 1910, and has married John Hogan by 1920. They are living with his brother James and her sister Anna. In 1930, Julie and John are living on Calhoun Road near Rudy Street. He is a foreman in a plow factory. They are renting their house for $7 a month and do not own a radio. The 1930 census was the first to ask if the family possessed a radio set, and as far as I can tell, no one in the entire family tree possessed one that year. Julia was very dark-skinned, as were several members of the Smith family, a trait attributed to their Native American blood, according to her brother Jim. Her niece still living said that one day her late husband and another man drove by Julia’s place. She was outside and her husband waved. “What are you doing waving at that n-----?,” the passenger asked. “That’s my wife’s aunt,” her husband replied. Grace "Gracie" Hogan, born 1921. Annie Mae Hogan, born 1924. Richard Hogan, born December 1925. He drove a fire truck in Rome and married a woman named Mildred, surname unknown. They lived in the Armuchee district in Floyd County. Eugene Hogan, born date unknown. And one child still living, born May 1927. Cora Lee, Oscar, George, Cann, and Annie, taken in 1963. SOURCES include Jason Edwards and the Brownlow family website. I especially want to thank a family descendant for the photos. Page last updated 22 October 2012.